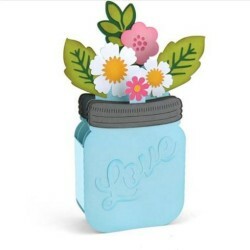 And as nice this Mason Jar Box Card was I didn’t think it was worth the $1.49 she was asking for. If you look at it closely, it just a Jar SVG with two rectangles on its side. I guess its a box but I have always felt that a box had a base. You know to make it a box. My guess the side are about one inch maybe an inch and half. With a second jar “box” inside, maybe equaling half an inch. 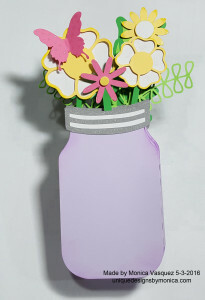 with random flowers and leaves slapped on to some blue card stock poles. So I looked through my SVG that I had made…. 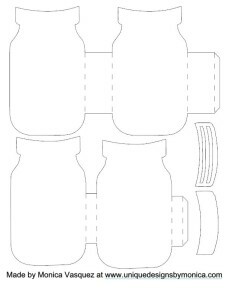 However now that I think about it I am sure you can find any Jar SVG on the Silhouette Cameo website. Then added two rectangles on each end both equaling an inch. Put some score marks so it could fold. Repeated the process only making the rectangles half an inch so it could fit inside the “box” card. If you want to try this project yourself click on the image below and go a head and print it. 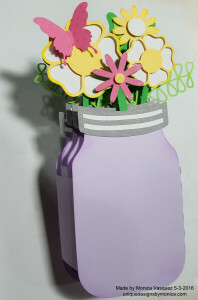 You can even port it in to your silhouette cameo or Cricut studio.